We came home from France last Thursday night and left the next morning for a 9-hour drive up to my parent's cabin. We blew one tire on the way up to our parent's cabin (turning the drive into a 12-hour trip), and another tire on the way home today. We are now experts in putting on the spare tire and hobbling to the nearest auto center. Despite these misadventures our week in northern Wisconsin was fantastic. How do medical information and patient preferences affect how a breech baby is born? I just finished translating an excerpt from a French article that examines the interplay of medical information and patient choice in breech presentation. The authors include eloquent observations on how giving one-sided information to patients about the risks of vaginal breech birth, but not the risks of cesarean section, is "disinformation." They note that vaginal breech birth might face extinction in France, not for medical reasons, but because social pressures have heavily influenced obstetricians' fears and patients' preferences. Original article: J Delotte, C Schumacker-Blay, A Bafghi, P Lehmann, A Bongain. Medical information and patients’ choices: Influences on term singleton breech deliveries. Gynécologie Obstétrique & Fertilité 35 (2007) 747–750. Excerpt from pp. 748-750 translated by Rixa Freeze, PhD, 2017. PDF version of the translation here. Email me if you'd like to read the original article and see their illustrations. Studies debating the preferred mode of birth for breech presentation highlight the value of studying and learning obstetric maneuvers . Medical information and patient preferences are both important criteria in influencing how women give birth to their breech babies. The type of medical information given to patients is crucial because it reflects obstetricians’ current fears. Moreover, the nature and bias of the information provided during consultations influences patients’ choices. Patients' preferences are also derived from their own knowledge, their interpretation of information provided by their provider, and the influence of their close associates and therefore of society as a whole. We first analyzed written information that specifically mentions risks related to vaginal breech birth. Indeed, the very act of including information about a potential complication in a patient’s file shows that the provider has overtly presented and emphasized certain risks. Written information included in patients’ files indirectly represents providers’ attitudes towards vaginal breech birth and how they likely discuss it in person with their patients. If, during a medical discussion, providers emphasize certain complications, they can influence patients’ choices. Although our study does not reflect the totality of information given to patients about breech presentation, it nevertheless provides a good approximation of providers’ overall attitudes during consultations. There has been an almost constant increase in giving patients this type of information (Figure 1). In 1996, no additional specific information relating to the risks of vaginal breech birth was noted in patient files. In 2005, this information was found in almost 70% of files. The value of this additional written information is debatable. Doctors have an ethical obligation to give their patients clear, unbiased, and honest information, and their care must be evidence-based. Thus, exclusively presenting the complications of vaginal breech birth without presenting the complications of cesarean section clearly shows how current controversies over mode of birth for breech presentation are influencing the type of information given to the patients. This one-way information is likely not fair or unbiased. This type of information is, in effect, disinformation, since patients only learn about the risks of vaginal breech birth but not about the risks of cesarean. Patients’ choices can therefore be influenced by providers who give their patients written materials to protect themselves from medico-legal risks linked to the duty of informed consent. A possible solution may lie in standardizing the information provided to the patient and in presenting the risks of both planned vaginal breech birth and cesarean in a fair and honest manner [7,8]. Creating such a document is difficult and must take into account different varieties of obstetric practice. While documents on the modalities and complications of cesarean section have been produced by obstetrical societies, there is no such document concerning breech presentation. Until the French College Gynecologists and Obstetricians (CNGOF) produces a patient information sheet, patient information is currently based solely on what each individual provider or institution provides. The second criterion that we analyzed, maternal choice, is probably influenced by providers but also by the beliefs of the patient or those around her. The rate of maternal demand for cesarean section for a term breech presentation was less than 10% until 2000, the year the Term Breech Trial was published. Since then, planned cesarean section solely for maternal choice has steadily increased to 25% today. In contrast, demand for cesarean section upon hospital admission, in patients who had previously consented to a vaginal breech birth during a consultation, increased at a slower rate. Nevertheless, this still occurs in nearly 15% of cases. This rate is particularly alarming since a cesarean performed during labor leads to increased maternofetal morbidity compared to planned caesarean section. Thus, if we consider the total population of women admitted to hospitals with a term breech presentation, about 30% of cases end in cesarean section due to maternal choice. This figure has tripled in the space of six years. So does the debate on breech affect medical information, or does the exposure of this debate in the media influence patient choice? It is probably a combination of these two phenomena, since comparing the curve concerning maternal choice with written information about vaginal breech birth shows similarities—in particular, a very significant increase in their respective rates beginning in the 2000s to a stagnation at the present time. Maternal choice, which is increasing in importance, has a strong influence on the debate over mode of delivery for breech. Indeed, to maximize reduction of maternofetal risks during vaginal breech birth, providers need to adequate experience and training during residency . Current maternal choices are leading to a decreased rate of vaginal breech birth. This trend also leads to a decrease in the practice and teaching of maneuvers for vaginal breech birth. If maternal choices continue to evolve over the next few years, the practice of vaginal breech birth may no longer be taught in hospitals. 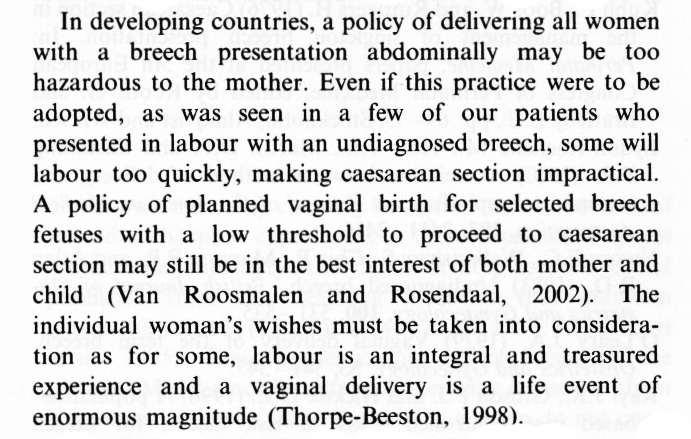 In the absence of a rapid change favoring vaginal breech birth, the choice of delivery route for a term breech presentation may disappear, not for medical reasons but because of a societal debate that has influenced obstetric practice. Breech delivery involves 3% of term pregnancies. Medical information and patients’ perceptions strongly influence providers’ abilities to learn and practice maneuvers for vaginal breech birth. This trend threatens the future of vaginal breech birth in France. Last day of school in France...lots of tears this afternoon. The individual woman's wishes must be taken into consideration as for some, labour is an integral and treasured experience and a vaginal delivery is a life event of enormous magnitude.